Global warming skeptics have said that meeting the United Nations Intergovernmental Panel on Climate Change’s harsh emission goals would require a return to life in the Stone Age. This seemed preposterous until we saw a photo of Rajendra Pachauri, Director General of the Energy and Resources Institute and Chairman of the IPCC. Suddenly, it all makes sense. 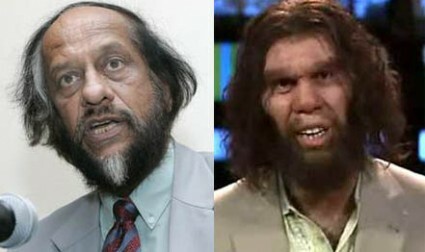 Pachauri and the Geico caveman. Separated at birth? all i can do is wide open my eyes and ask is it all they could do? The caveman is kinda funny. Pachauri sound like a degree collector. I’ve seen people who incompetent in the single degree they get. This guy seems incompent in his multiple degrees, and can you blame him, it’s hard to spread yourself so thin. How could he possibly think that glacial melt is a major water source? You’d have to be incompentent. Well, at least they didn’t use a lizard « Watts Up With That? I don’t take the Geico caveman seriously, why should I take this clown and what his group has to say seriously. AGW is a lie and a scam, being used to separate us from our hard earned money. Put all of these fraudsters and the banksters supporting their taxing scheme in jail and throw away the key. Confiscate all monies they have and return it to the people. Put Al Gore in the same cell as ‘Bubba’ (he needs a new play toy). @ #5 Richard; the Geico caveman is also more intelligent, at least he knows his limitations. Yes, you’re right! It was a shock to see him. Is this the best they could do? The man man looks dirty, and unshaved. He looks like the “holy” men in India- but they’re more honest and have nothing in the material. This “creature” hes a fortun e that he can afford to look better, fix himself up. Yes, indeed at all makes sense now. I think the Geico caveman is much easier on the eyes. He is certainly credentialed to run the UN “climate” program then! Of course, the “climate science” fraud is specifically and only about economics-it was hatched to transfer wealth-period. the UN is comprised of a bunch of dopes who want everyone but them to give their wealth to “developing” countries. Fact is, every dollar that goes into the UN, 70 cents is lost to graft. That is a true figure-and is one that will never change-since they are like the congress and the only oversight comes from within. It is very funny! I think I read somewhere that he also has a degree in mechanical engineering. correct me if I am wrong-but isn’t Pachauri an economist and doesn’t even have a minor in meteorology, geology, or climatology? The caveman comparison is also rude to the GEICO cavemen, who are just trying to be accepted as human beings! I love the separated at birth stuff and have done some myself and wish I had done this one. Excellent! There are probably more jokes…maybe Al Gore on a pile of money watching us.